Miguel Ángel Ruiz Carnicer is professor of Contemporary History at the University of Zaragoza (Spain). His research focuses on the Falange, universities and culture during the francoist dictatorship. This book brings together recent research by a group of specialists in history and sociology to provide a new reading of the late Franco dictatorship, especially in relation to its political culture. The authors focus on the election of local, trade union and national representatives, the work of the first Spanish sociologists, the struggle over administrative reform, the role of the media and the intellectuals, as well as the evolution of the dictatorship's political class and its response to the regime's decline. Not only are the politics of the late dictatorship scrutinised, but also the mechanisms that were deployed to control the fast-changing society of the 1960s and 1970s. 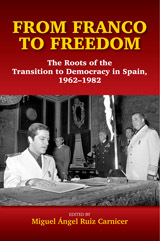 In examining the late Franco period, the contributors do not believe that it contained the seeds of Spain's later democratization, but maintain that certain sectorial regime initiatives – electoral and political changes, an evolving discourse and an interest in political processes outside Spain – made many Spaniards aware of the dictatorship's contradictions and limitations, thereby encouraging its subsequent political and social evolution. This transformation is compared with the latter stages of the parallel dictatorship in Portugal. The great majority of Spaniards felt that the embrace of democratic freedoms and integration into the European Community was the only way forward during the Transition. But the shift from dictatorship to democracy from the 1960s onwards in Spain needs to be understood in relation to the multitude of political and social changes that took place – despite the opposition of Franco and the 'bunker' mentality of the regime. These changes manifested in a complex interaction between internal and external factors, which eventually resulted in the transformation of Spanish society itself.